Want a kid friendly way to prepare fish? 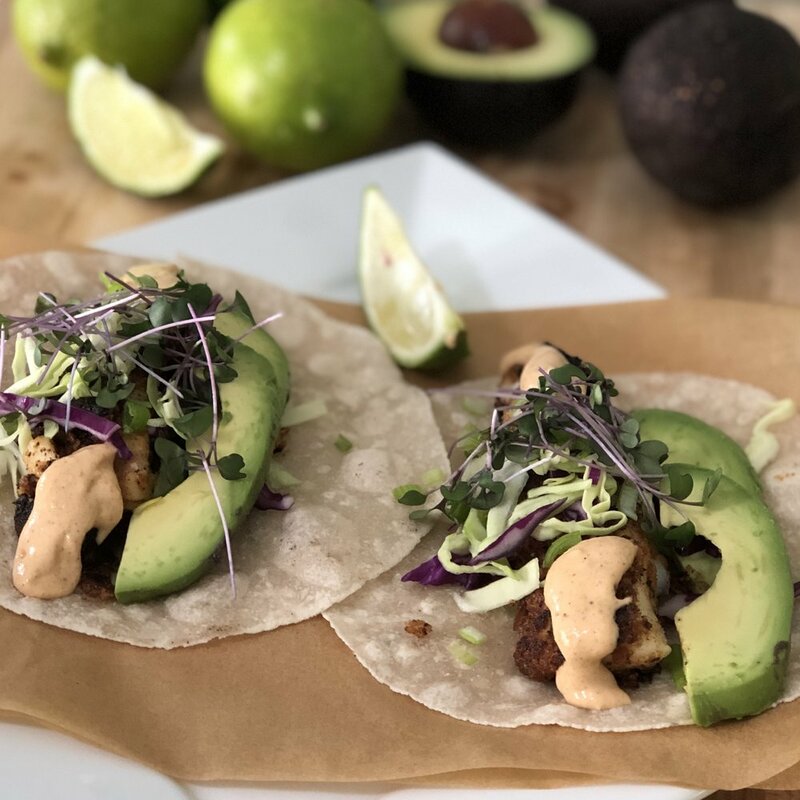 Try these Coconut Cod Tacos! 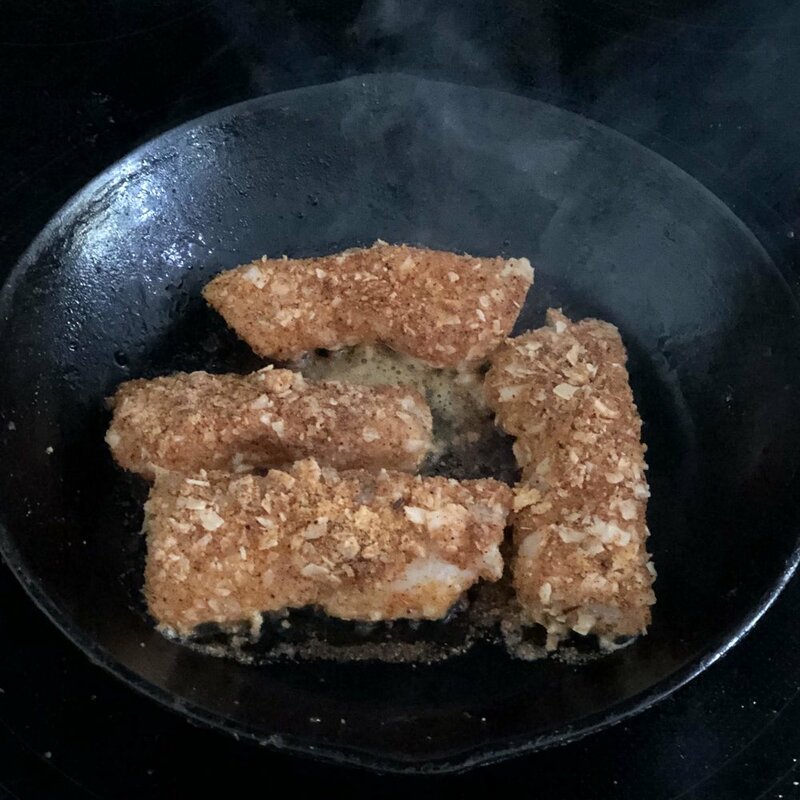 Naturally sweet coconut flakes and very mild cod together make a great starting place for the fish averse, whether kid or adult. My 16 year old hates fish but he loved these. I’m including both Air Fryer and Stovetop Fry version. The stovetop came out crispier, but of course, you can’t beat an air fryer for less mess and quicker cook time. Either way, you will most likely have to do two batches to allow enough space for fish to crisp up. Air Fryer version on left, stovetop on right. Stovetop is crispier, Air Fryer less mess. It’s your choice. Are you on Whole30? Make a Coconut Cod Taco Bowl. Use all the same toppings and use cabbage or cauliflower rice as your base. See step by step photos below for prepping fish below. 1. Cut filets into finger-sized pieces. Season liberally with salt and pepper. 2. Place egg mixture or almond milk into one shallow bowl or pie plate and combine the coconut flakes, almond flour and seasoning in another. 4. Combine all ingredients for Chipotle Mayo Sauce. Taste and add more lime juice if you want it tangier and more honey if it’s too spicy. 5. For Air Fryer, arrange a single layer on the tray and spray with coconut oil. Turn and spray the other side. Cook on 400 for 6 minutes turning halfway through. Remove to a clean plate and cook remaining fish. 6. For Stovetop, heat about ½” of oil in a large skillet until shimmering. Add the fish pieces in one single layer and cook for a minute or two then flip (they should be brown). Cook the other side until fish is beginning to flake. 7. Serve on warm tortillas with Chipotle Mayo Sauce and remaining ingredients that you prefer.